New release: The Ghost Whisperer! And … it’s here! The third episode in the Coffee & Ghosts series is live. 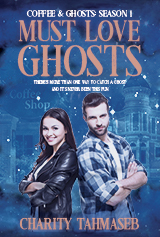 When it comes to the supernatural, Katy Lindstrom–ghost hunter and expert coffee brewer–always knows what to do. Give her five minutes and some excellent Kona blend, and she’ll trap your ghost. Katy is completely unequipped when a mysterious and beguiling ghost whisperer floats into town. The so-called Mistress Armand charms away Katy’s clients and accuses her of ghost cruelty. At the town-wide séance, nearly everyone falls under the ghost whisperer’s spell–including Katy’s business partner, Malcolm. But Mistress Armand isn’t the benevolent, new-age medium she pretends to be. She craves something dark and shameful from the citizens of Springside Township. This time, Katy is going in blind. This time, coffee won’t work. And this time, she may need to give up something shameful of her own. Just 99 cents or read for free with Kindle Unlimited!